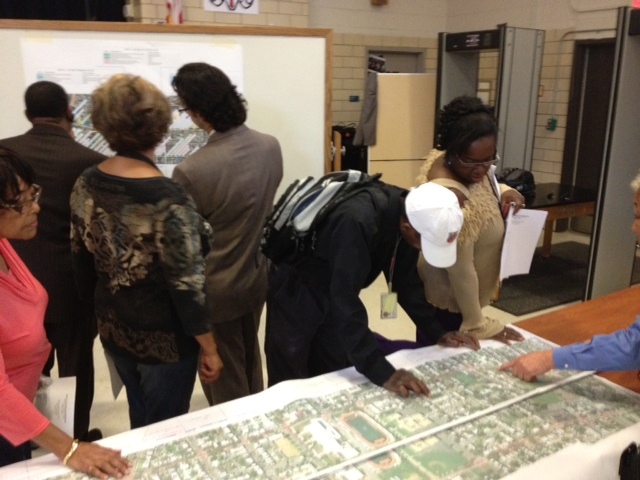 Residents review final recommendations at the Sept. 26 DDOT 17th & 19th Street Safety Improvement Project meeting. Last night, the District Department of Transportation (DDOT) held a public meeting to share their final recommendations for the 17th & 19th Streets Safety Improvement Project. Overall, I’m pleased with the recommendations…particularly for 17th Street SE. DDOT and their consultants, McKissack & McKissack, listened to the concerns and recommendations residents offered at the July public charrette meetings. Street remains one-way but narrows from two lanes of traffic to one lane of traffic, with the exception of two lanes between E Street SE and Potomac Avenue SE. Addition of a dedicated bike lane to 17th Street SE on the west side of the street along the corridor. Curb extensions or bulb-outs on the west side of the street at each intersection along the entire corridor. East side maintains stadium event parking restrictions. Street parking is maintained on both sides of the street. On street parking between E Street SE and Potomac Avenue SE will move to the western side of the street. Commitment to consider putting a four-way stop at 17th & D Streets SE if determined necessary after changes are implemented. Installation of permanent electronic speed display signs and new speed limit signs at multiple points along the corridor (NE and SE). New painted crosswalks at each intersection. Entire corridor will be re-paved and current rumble strips (which just generate noise) will be removed. No truck and bus restrictions…but hopefully single lane and opening of new 11th Street bridge will make 17th Street a less attractive route for trucks. Remains one way with addition of shared bike lane along the entire corridor going in the northbound direction. Rush hour parking restrictions removed. Consider stadium traffic flow and potential Hill East waterfront development when implementing changes. 1800 block of Potomac Avenue SE remains one way. The recommendations do not address the stretch of 17th Street SE between Potomac Avenue SE and Barney Circle SE. When I asked about this at the meeting, DDOT said they plan to review this stretch of 17th and will likely make recommendations similar to the rest of the corridor. I will certainly push for curb extensions and improved pedestrian crossings at the G Street SE and H Street SE intersections. A resident raised a concern about 17th going from one lane to two lanes between E Street SE and Potomac Avenue SE. She envisioned vehicles using the extra lane to speed around vehicles in front of them, creating a dangerous situation for pedestrians. DDOT said that they would review the intersection and will consider a raised crosswalk for this intersection. Overall, the recommendations are good news. The only “bad news” is the implementation timeline. Once the affected ANCs, including ANC 6B, review the recommendations in October/November, the project will enter a lengthy design phase. DDOT estimates that actual implementation would take place in the spring of 2014. DDOT is also not inclined to implement the recommendations on a rolling or incremental basis, preferring to do the entire project at one time. While I certainly understand that DDOT needs time for design, I would prefer to see some of the recommendations implemented in the short-term. Hopefully, ANC 6B’s request for a speed camera on 17th Street SE will also help slow traffic down in the interim. Commissioner Francis Campbell (6B10) and I plan to ask ANC 6B to put the 17th & 19th Street Safety Improvement Project recommendations on the Commission’s November 13th meeting agenda. If you have questions or concerns about the recommendations, please post them below, contact me directly or plan to attend the Nov. 13 meeting. Also, if you attended the meeting last night, feel free post any recommendation/comment that I missed. Thanks to everyone who took time to attend the project meetings! This entry was posted on Thursday, September 27th, 2012 at 8:38 am and is filed under 17th Street SE, 19th Street SE, Transportation. You can follow any responses to this entry through the RSS 2.0 feed. You can leave a response, or trackback from your own site. Amazing news. Flahaven for City Council…make that Mayor! This is wonderful work. Thank you so much. Is a speed camera still in consideration? We’ve been trying to get one of these around the 300-400 block of 17th Street SE for a long time. Thanks for the question. Yes. Speed camera is still under consideration. MPD has ANC 6B’s request for a camera on 17th Street SE. Waiting on the DC Council to approve the new camera contract. This is exactly what I thought too. Also, dangerous for passengers and drivers in other cars, and bicyclists in that bike lane. And actually, those drivers won’t even wait for the extra lane, they’ll try to pass the slower cars in the middle of the intersection as they cross E St. before they get to the second lane. So dangerous! Great work Brian! I have been out of town for work and it was wonderful to come back to this post. It’s not my ideal plan, but it will be a HUGE improvement. I wish they would look at making the 1800 block of Potomac two-way — the transition to one-way causes most drivers to speed up considerably on that block, usually as they enter the dangerous intersection of Potomac, 18th and E in front of Congressional Cemetery. Speaking of that intersection, I wish they would add curb bulb-outs and better crosswalks there. I have nearly been killed numerous times by cars making a high-speed left turn from Potomac onto 18th Street as well as by cars turning right from 18th Street onto Potomac (they seem to think the stop sign is a suggestion.) Plus, at least a few times a week, I see a dog walker nearly run down as they attempt to cross Potomac to reach the cemetery. I swear some drivers actually speedup when they see someone in the crosswalk! Ideally, the entire intersection would be redesigned to slow down cars and make it safer for pedestrians. But I quibble — excellent work! Great work Brian! We need to slow down traffic and make it safer for pedestrians and cyclists.